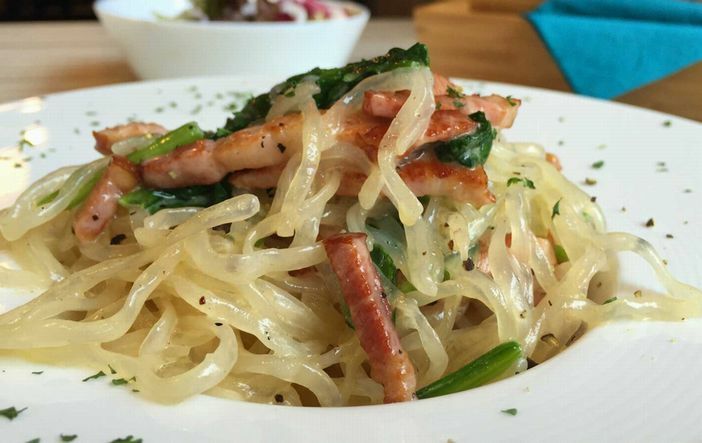 Konnyaku carbonara recipe - a healthy choice! If you want to enjoy the deliciousness of carbonara, but worry about the calories, then this recipe is for you! By substituting pasta with dried konnyaku noodles, not only your calorie intake will be reduced, it is also a healthy choice. 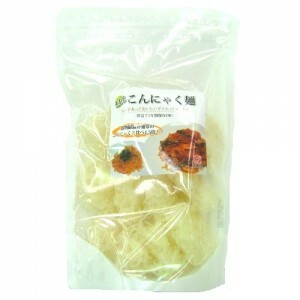 The dried konnyaku which is made from ‘mukago konnyaku’ has 1.5 times more water-soluble dietary fiber called glucomannan than the regular konnyaku made in Japan. It lowers cholesterol and helps control blood sugar in diabetes. It also increases the feeling of fullness, so it may even help with weight loss. Our konnyaku noodles are pesticide-free, made from organically farmed konnyaku yam. The noodles are perfect for cooking as they absorb the flavors of the seasonings well and have a great chewy texture. Try this carbonara recipe and you won’t be disappointed! 1. Put the eggs and yolks into a bowl and whisk them. Put in the thickened cream, put a dash of Parmesan cheese, season with salt and pepper, then mix well with a fork and put to one side. 2. Put olive oil in a large pan, crush garlic with the back of the knife, remove the core and cook on low heat until fragrant. 3. Put bacon and cook on low heat for about 5 minutes until golden brown and crispy. 4. Pour the white wine into the pan and let it bubble away for a few minutes until a small amount of liquid is left. 5. Bring water to a boil in a pot, put in the konnyaku noddles. Then remove from the heat, let the noodles rest for 7 minutes. Drain the konnyaku noodles in a colander and rinse them under the tap with hot water (this rising in necessary to remove the tapioca syrup coating). 6. Pick out and discard the garlic from the pan, then add the konnyaku noodles. Toss well over the heat, then remove the pan from the heat. 7. While the pan is still removed from the heat, pour in the egg mixture. Whisk quickly until the eggs thicken, but do not scramble. 8. Turn the heat low again, season with salt, toss in the Parmesan cheese and mix until the noodles are coated, and the eggs are viscous but still have some liquid. 9. Remove the pan from the heat and serve with an extra twist of pepper. You can also add any vegetables of your choice (e.g. spinach, asparagus); just toss them in before pouring in the eggs.